There’s no better time to re-think your inventory of promotional products than Q1. By this time your business has jumped head first into 2018 and the ride is monumental! 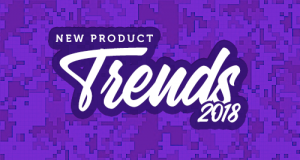 Now you’re ready to look at some new ideas in trending promotional products. Every year, we let our customers know the latest roundup of trends that we predict are going to shine in the year ahead. These styles are based on the expertise of our merchandisers, trending tools and the input of millions of visitors to our website. So, sit back, slip on something ultra violet, and relax because ePromos is showcasing ultramodern developments in the world of promotional products. Here are the top 10 trends that will knock your customers’ moisture-wicking full-color custom socks off! Illumination anyone? Surprise your corporate guests with light-up drinkware and some flashy accessories. Visually entice and enlighten event attendees – both literally and figuratively – with novelty giveaways. Brighten your future sales outlook by ensuring visitors stop at your booth during your next fast-paced tradeshow. Light-up advertising is the all-American staple that is getting the bright treatment as luminescence is being paired with glasses, pens, and golf giveaways, as well as fun rings and bracelets for evening affairs. Businesses most likely know that social messaging overtook social media and chatbots are becoming the norm, so businesses cannot afford to ignore social customer service. Businesses also can’t ignore that the world wants Bluetooth technology. We are talking about promotions like Bluetooth keyboards, speakers and fitness trackers. If you’re giving away wireless earbuds or headphones, make your gift a set and add a fanny pack so smartphones are safely tucked away. Yes, we said fanny pack. One of the most taboo accessory trends of all time is making its comeback and it’s officially cooler than ever. This trend has been spotted on Kendall Jenner, Rihanna and Bella Hadid, proving the revamp is here to stay. Wearables are still dominant in 2018 because you can find a wearable device or accessory fit for any situation and useful in any operation. Wearables are also trending for four more great reasons: First, wearable technology is useful. Next, we can easily monitor our activities with wearable fitness trackers or pedometers. Third, wearables leave us free to go about the day without being tethered. Finally, accessories that hold tech equipment and the technology-based devices are comfortable to wear all day long. Take it from us, there is no neutral ground here, the trend statement is clear when it comes to the preferred palette: big, bold hues. You’ll find this bold-colored option in almost every category of products. Just take a look at our tote bags and promotional hats. You’ll find saturated shades of color in our promotional apparel, too. Burst out of your brand in bold colors to grab the attention of your customers. More new colors to look for are seafoam green, plum, and ultraviolet – the color that was voted Pantone color of the year. If your company supports a charity or if your employees believe in a cause, choose to market your business AND lend your support to a charity as a form of community outreach. Choose a t-shirt, polo shirt or athleisure sportswear to announce your sponsorship. Sell hoodies, blankets and hats, then pledge a certain percentage of proceeds to your company’s charity of choice. The idea is to not just speak your passions, but to broadcast them to the world-or at least to everyone looking at you. We’re proud to carry the Basecamp line, in which a portion of the proceeds from each sale support the Warrior Spirit Retreat, a place where wounded Veterans go to heal. There is definitely a huge housewares vibe happening right now. What’s more popular than displaying your logo on everyday household items? Grab hold of this trend by expressing your brand on common kitchen items or useful and unique grilling goodies. Feel free to double up on trends by referring to Top Trend #4. Choose a bold-color apron, kitchen utensil or fly swatter! New year, new branding, new trends! And there’s no better way to show your customers that you’re on top of it than by giving away a gift designed with bold patterns. From drinkware with bold designs to eye-catching t-shirts and teamwear, brave new fashions will keep your company unique. You can’t go wrong with promos that have a retro feel. By retro, we mean nostalgic items that transport your customers back to the 50s, 60s, 70s or (sometimes) the 80s. Popular retro merchandise has a modern use, yet it turns back the clock to a “better time.” Great examples to get your creative juices flowing are rocket launcher pens, metal lunch boxes and old television set keychains. Make sure you see the corporate apparel with a retro theme like bowling shirts or truckers’ caps (recently known as Richardson caps) with cool mesh for a 70’s throwback look. The fidget trend is not over! Popular toys like the fidget cube and fidget pen continue to bring traffic to convention exhibits. Do you want the newest spin on fidget spinner? The craze right now to work out nervous tension is the fidget flip stick. This new desktop toy will challenge anyone. The idea is to tip over the toy, let it flip and catch it with a finger. Playing with this rollover toy is not only fun, but this recreation can sharpen a person’s focus. Other fidget ideas include the fidget ball and the fidget bottle opener. Within the safe and secure promotional products space, it seems weird to speak of trends; however, there are many ideas that we are excited about. We have already started to love the latest reflective products and safety whistles. A loud whistle is extremely reliable because it attracts attention, won’t lose a signal or run out of batteries and is practical for scaring away animals or someone who means harm. We can’t wait to see more of in the coming year. With these cool products and pops of color, these safety and security trends are absolutely sticking around. In 2018, the wellness trend continues to grow for the well-being of everyone on the planet. Your customers are probably gravitating toward all types of products they perceive to be more natural. At ePromos, all-natural promotional products are available, and they are thriving. We think all-natural is more than just a trend or a passing fad, it’s clearly more of a movement toward a better lifestyle. There you have it on the top trending promotional products! ePromos (highly anticipated) predictions are in, and you have the inside look at the biggest trends for 2018. These are trends your company should get behind to start building your brand, so you are the company people are talking about in the year ahead. Give us a call at 844-321-9236. Love this post? Read about 2018 Tradeshow Floor trends.